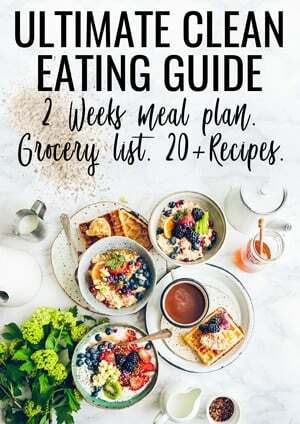 The ultimate low carb guide to learn how to start a low carb diet including low carb food list and easy low carb recipes. You probably have heard about the low carb diet, it is actually the diet I am following for 5 years now to reverse my pre diabetes. The first time my GP told me that I have to go on a low carb diet it was really unclear. It raised so many questions in my head. What carb means? What does it change in my daily meals? And what is my ideal carb intake per day? 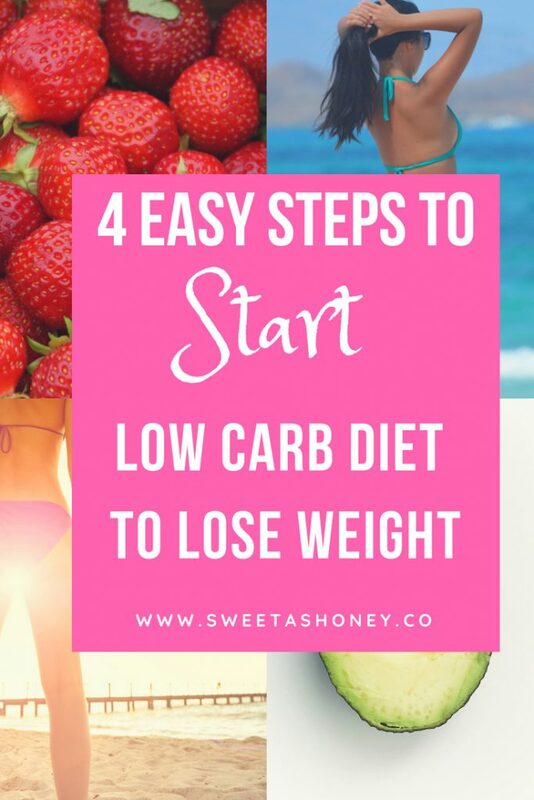 So here are my answers on how to start a low carb diet. What’s a low carb diet ? The low carb diet or low carb high-fat diet (LCHF) consist of reducing the amount of carbs you eat focusing on real food choices. It means you eat mainly un processed food, packed with fibers, protein and healthy fat. The low carb diet avoids sweet foods, starchy food like pasta, rice, bread or potatoes and focus on healthy fats, moderate protein and low carb vegetables. Instead you will eat high-fat food like butter, cream, olive oil an high protein foods like meat, eggs or fish. Protein and fat don’t stimulate insulin production and keep your blood sugar stable. This ultimate low carb food list gives you a great idea of all the food you can eat on a daily basis. It is a great low carb food list for beginners as it list all the basics food syou should have on hands to start a low carb diet. What not to eat on a low carb diet + smart carb food swap! Of course there is also a full list of ingredients you can’t eat on a low carb diet but there is always a low carb recipe alternative on my blog to fix your craving. Example: if you are a sweet tooth in the morning and you wonder what to eat for breakfast on a low carb diet check some of my recipe below. You will discover how easy it is to make homemade sugar free breakfast that taste amazing! Whatever you are diagnosed with type 2 diabetes, pre diabetes or just want to lose weight, a low carb diet is perfect to reach your goal. Learning what are carbohydrates and controlling their amount in your food is one of the most important things to gain control of your blood sugar level. Carbs or carbohydrate consumption directly impacts your blood sugar level, triggers insulin release from your pancreas and stimulates sugar craving – hunger. The science behind carbohydrate could be very confusing. To keep things simple, remind that all carbohydrates contain sugar and it means that even your vegetables contains sugar! There is simply lots of different sugar molecules – glucose, fructose, maltose etc. they are simply released at a different speed into your blood stream. Many articles will tell you that there is only two classes of carbs the ‘Good Carbs’ and the ‘Bad Carbs’. The truth is there is 3 classes of carbs. Starch. Foods high in starch are starchy vegetables like peas, corn, potatoes but also dried beans like lentils and grains like oats, barley and rice. The grain group is the one that will provides the most fiber to your body. But be careful you have to eat wholegrains product that contains all parts of the grain to get all the nutrients that grains have to offer. Sugars. There is two main group of sugar the natural sugar like lactose in milk or fructose in fruits and added sugars the one added to processed foods. Do not forget that there is many different name that hide high sugar contents like obviously white sugar but also molasses, raw sugar, maple syrup, agave nectar, honey, beet sugar, cane sugar etc. I know that there is many confusion between low carb and unrefined sugar. It is not because you are using unrefined sugar like molasses or agave nectar that it does not bring carb into your diet. When you read the nutrition label of ingredient the mention ‘Sugar’ will include both the natural and added sugar. Just keep in mind that your body will process differently fructose, lactose and sucrose. Usually fructose is slowly processed which means that for a same amount of carb it is always better to eat a fruit (fructose) rather than a processed sweet snack (sucrose). Fibre, are the indigestible part of plant foods including fruits, vege, wholegrains, nuts and legumes. When you eat them most of it pass through the intestines and is not digested. Scientific studies recommend to eat between 25-30g of fibre everyday. But unfortunately most of people do not eat half of this quantity each day. That is when you understand Carbs and what is fibre and sugar are that you are now able to decrypt nutrition labels. First of all always look at the quantity per 100g which makes things easier when comparing product for which the serving size is not always identical. Total Carbohydrates will include the three classes above. Most of the time the label will give you the amount of sugar too – which include natural and added sugar. Then you will have a breakdown with the fibre amount also called dietary fibre. Because fibre are not digestible by your body most studies set up the hypothesis that we if the product contains more than 20 g of fibre per 100 g, we could remove half of the fibre content to the carb count. It know explains why coconut flour or lentils are considered as good in a Low Carbs diet. Look at the example below to understand why it is better to use coconut flour rather than white flour. Check my coconut flour recipes here. Most people on a low carb diet will count net carbs it is basically total carbs minus fiber and sugar alcohol (like erythritol or xylitol not maltitol). Net carbs are the digestible carbohydrates in your body. In the example above we proof that White Flour contains 2.4 times more carbs than coconut flour. Figure out how much carb do you need per day ? There is different variant of the low carb diet and you should choose the one that fit your health background. I personally follow a low carb diet limiting my carbs to 50 g per day. Some people don’t count carbs at all and focus on eating low carb real food. The quantity of carbs you are allowed per day really depends on your health condition, age and size. The calculation divide your daily calorie intake by 2 because 1/4 of our food should be coming from carbs. Then 1 g of carb contains 4 calories so we divide the total amount by 4 to have the total carbs you are allowed to eat per day. So if you are on a 1600 calorie diet it came to 100g/carb per day. This is for a moderate low carb diet ! The best way to succeed the low carb diet is to cook your own meals. You will find delicious low carb options at the store but if you really want to live a low crb lifestyle on a budget you must cook your own meals. I am here to share with you how easy you can make your own low carb wraps, dinner and dessert with less than 10 ingredients. The low carb lifestyle is not hard – and can actually be fun and super tasty! It is all about rediscovering new ingredients that are healthier for you than others and to get the ideas to eat them the fun way. I love to share with you my easy low carb recipes all sugar free, made with few simple ingredients. My passion is to show you that low carb recipes are tasty and family friendly. Check all my low carb recipes on the blog here. If you are a sweet tooth you came to the right place. My mission is to show you how you can enjoy low carb sugar free dessert everyday. I reverse my pre diabetes enjoying sweet treats everyday. Check all my low carb sugar free dessert here. I hope you enjoyed this ‘how to start a low carb diet’ post. Leave me a comment if you need any help or have any questions. Great tip on looking at the quantity per 100g. It also makes the calculation of carbs easier. Thanks!